Notes The first snow course of the game. Everfrost Peak is an area in the Snowflake Mountain area of Timber Island in the games Diddy Kong Racing and its remake, Diddy Kong Racing DS. In the original N64 version of the track, all three vehicles are usable on this track. In the Nintendo DS remake, Cars are not featured among the options because the water at the start of the level is no longer frozen. 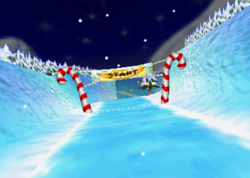 This track is the smallest and most simple snowy track out of the four within the game. The arches are more snowy in the Nintendo 64 version of the game, as in the Nintendo DS version, the arches are a dark black color, and appear to be more rocky than snowy/icy. The arches in the DS version are also slightly bigger, and seem to be thicker than the ones that are in the Nintendo 64 version of the game. Krunch approaching the arch before the cave. At the start of the race, players start in a plane and the frigid road starts off by curving slightly to the right, then to the left with some boost pads on the ground as well as in the air. The sides of the road have big, cold snowy mountains with a bunch of snowy trees on the top. Soon, the racers approach a long, freezing river with some edges sticking out with some collectibles on them. Also, some snowmen with scarfs start appearing along with the trees on the mountain tops. The freezing river also curves slowly to the left. When the curve is over, the river continues to go straight for a bit as the racers approach an arch hanging above the water from the frosty mountains on the sides of the river. It is nearly in the middle of the racer's flying route, so they have the option to yield over the arch, or cautiously dip underneath it. The river ends as the frosty road returns with some Item Balloons just after the current comes to a stop. Next, the racers enter an ice cavern, curving to the left and then slightly to the right. The ceiling of the cavern seems to lower at the first curve. The ice is also a darker blue color and seems to be more thick. Once the racers exit the cave, there is a split path with a big, mountainous chunk of ice in the middle separating the two paths. Both paths are pretty much identical, as they are both very short and stay parallel to each other. While the racers are going on the split paths, they are also going on a big downhill. Once the downhill ends, the two paths rejoin back into one big, frigid road again. Then, the road curves right as the racers go under or over another arch hanging from both of the snowy mountains on the sides. There is also a boost pad on the road if a racer chooses to go under the arch. Then the road curves slowly to the right, with some more boost pads on the ground as well as in the air. Finally, the road makes some small zigzags as the racers approach the finish line for their next two runs. Diddy racing in Everfrost Peak in Diddy Kong Racing DS. This page was last edited on December 18, 2018, at 21:07.